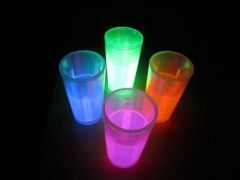 Premium Quality Glow Barware that glows brightly for 8-12 Hours and beyond! These are excellent additions to any bar or drinks event. Choose from the ever popular Glow Motion Straws or perhaps brighten up the evening with a glow cup or two. These glow products are always freshly imported and have a shelf life of 3 Years!